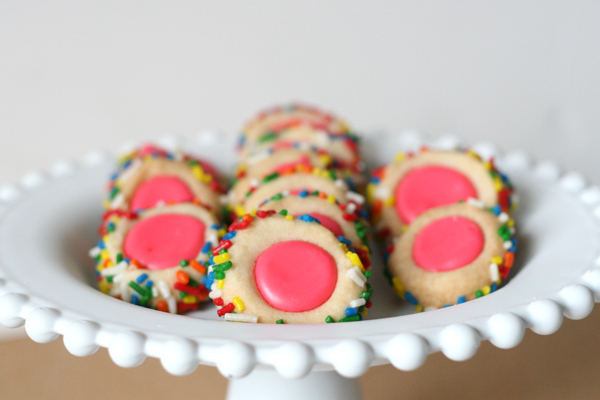 It's no secret that my sister has a thing for iced thumbprint cookies - I don't blame her, they are delicious and extremely addictive. I think it's the sweet/salty combo of the cookie with the icing that makes them so addictive. Anyway, when she presented me with the challenge of duplicating her favorite cookie I couldn't turn her down. I'm always up for a challenge, especially when I get to taste-test the efforts. After a couple of attempts, a serious fail and many scribbles on my recipe card, I finally came up with a decent contender. While they may not be exactly right just yet, they are pretty darn close. So, with that, here's a recipe for you to make your own! In a blender with the paddle attachment, cream the butter and sugar on med-high until pale and fluffy. Reduce the speed to low and slowly add the flour and salt until combined and pulls from sides. 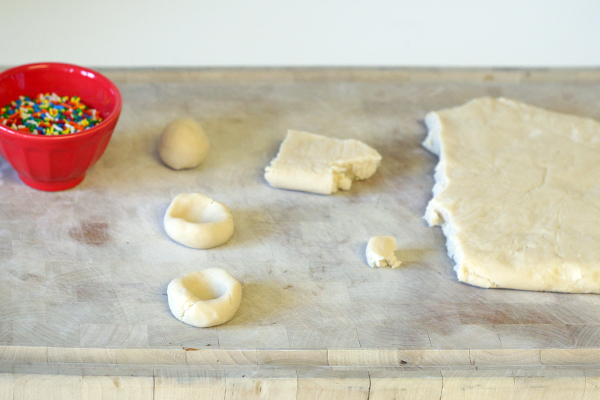 Form dough into a disk, wrap with plastic wrap and refrigerate for about an hour. Form little balls, about 1/2 tablespoon or so in size, make an indention with your thumb and roll the sides in sprinkles. I found it worked best to roll out a couple of balls at a time, then make a thumbprint and immediately roll in sprinkles while the dough was still a little warm from your hands. This helped the sprinkles stay on the best. Once you have a cookie sheet full, bake for 10 minutes at 325 degrees. You'll have to take the pan out and press the thumbprints back down and then return to the oven to bake another 10 minutes or so. You don't want these browning so watch them carefully. To make the icing, just whisk the milk and powdered sugar together in a small bowl and add in some food coloring. If you want to make several colors, just pour a little icing into separate dishes and add the colors you want. I used a teaspoon to scoop up the icing and then poured it into the thumbprints. Now, here's the hard part. You have to let the cookies sit for at least 6-8 hours so the icing sets and gets hard. It's tough, I know, but well worth the wait. Another way prepare these is rolling the dough into a long tube shape and then rolling that in a pan with sprinkles. Then cut you the cookies and add you thumbprints. Just an inside knowledge from when I worked at the bakery that sells these! Your method probably works best for small batches though. They are one of my favorites. Oh, Ashley, that is great advice! Any inside knowledge on how to better this recipe!? I plan on making these today and after I taste them I will give you some feedback! When I make the icing I use melted butter, some vanilla extract, mix in some powdered sugar until thick and then add in the milk to thin the consistency so I can put pipe it in the center. I don't have any measurements unfortunately. Ok, I do but it makes enough to ice about 1,000 cookies! I have to scale it back a bit to make it at home! HA! Did you make them?!! I'm making them for my youngest's first b-day party this weekend and would love some tips. I'm thinking of using shortening along with the butter, well cutting the butter by half and substituting with shortening. Wondering what that will do. I'm definitely trying your icing!! Yay! You are so very welcome!! Let me know what the kids think, or you! Isn't there Vanilla in the cookie dough??? I see it in the picture, but not the ingredient list. But I'll let it slide since you have preggo brain. LOLOL!! Ahh, Becky, I was hoping no one would notice that. I used vanilla in ne of the attempts at the cookie part and had that in my ingredient shot. In the preferred method, of my choosing anyway, I omitted the vanilla and was too lazy to take another picture! Already pinned. Wish I had them made and in my kitchen! Thanks! I hope you enjoy them!! About how many of these did this recipe make? Hey Christa, they made about 50 or so. Two full cookie sheets full. Thanks! I cant WAIT to make these! I was wondering the serving size because I wanted to add up the weight watchers points....2 pts each! Congrats on the sweet baby girl!!! Definitely making these after my race tomorrow! Those look so pretty and yummy! I was thinking I should ask my husband to make them for me, but then I read, "In a blender with the paddle attachment..." Aw, man! We don't have one. Well, we have a blender, but not the big countertop kind that has such things as paddle attachments. I keep asking him if he would like to have one, but he claims he wouldn't use it enough to justify the cost or the space. Oh, well... In other news, I keep checking to see if you're "still here." :) Praying for a great delivery! Hey Jenny, I'm sure you could just use a regular blender and have the same results. The cookie may not be as flaky, but other than that, I'm sure it would taste just as good. Thanks for the prayers on the delivery! It went great. I used a regular hand mixer and they turned out really flaky! My best guess would be the vanilla goes into the icing. I didn't even notice it was pictured until I read the comment above. I wrote the recipe down before I read the comments and was surprised there wasn't any vanilla in the icing. I will probably just add a teaspoon or so to it. Hi Lisa, the first version of cookies I made had vanilla in them. The final version didn't. I was hoping no one would notice that silly bottle and was too lazy to take another ingredient shot picture! I should have known better. If you want to try adding vanilla to the icing, I'd cut the milk down because it may make it too runny. Good luck and let me know how they turn out!! Yummy!! Can't wait to make these!! When you say blender, are you talking about a countertop mixer with paddle attachment? They are a little salty, that's one of the things we like about them though. I would just decrease the salt to 1/4 teaspoon and try that and if it's still to salty for your liking, use 1/8 teaspoon. As for the cracking, I'm not sure why that is happening. The dough is basically a shortbread dough, which is supposed to be flaky, but I didn't have a problem with them breaking when you touch them. Sorry, I'm no help on that one. You could always try a sugar cookie dough instead and that would give you a sweeter, less salty base but it may be a little sweet with the frosting. I agree - way fragile and didn't turn out very well. I have made shortbread cookies several times and these were very different. Tasted good but didn't hold together at all (for me). Will try to alter next time. Bummer. I hate to hear that. I'm not sure why that happened. I've made them several times now and haven't run into that problem so I don't have any tips on how to avoid it. Sorry. I've been told that if you don't really really mix the butter and sugar it will result in breaking. When I use my stand mixer I leave my butter and sugar to cream for about 5 minutes with a whisk attachment. I made these over the weekend and everyone loved them! Amazing!! Awesome! Thanks for coming back and letting me know!! 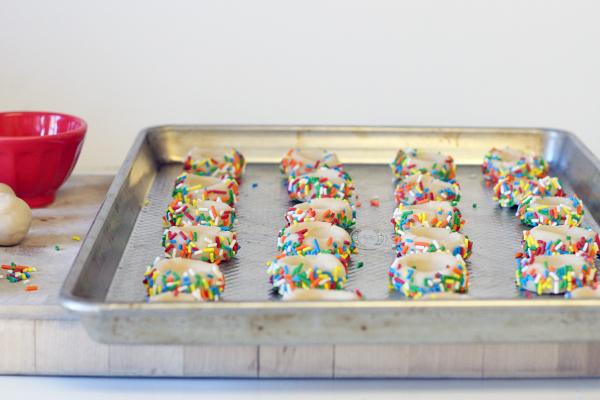 I'm going to make these this weekend for my cousin's graduation party and ice each cookie with a different letter to spell out "congratulations" or something. So cute! That is such a cute idea! Love it. I hope they turned out well for you! Trying to cut several corners here... could a pre-made sugar cookie dough work alright for kids? I'm very short on time and these are just adorable! So sorry to hear that. I guess we all have different tastes. I've made them several times now and can't get enough. Hopefully you find a recipe out there that suits your tastes. I stumbled upon your recipe when I had the idea to make "paw print" cookies to thank my cat's vet. I ended up adding flour because the dough didn't pull away from the bowl like you described. They were okay, but not great. 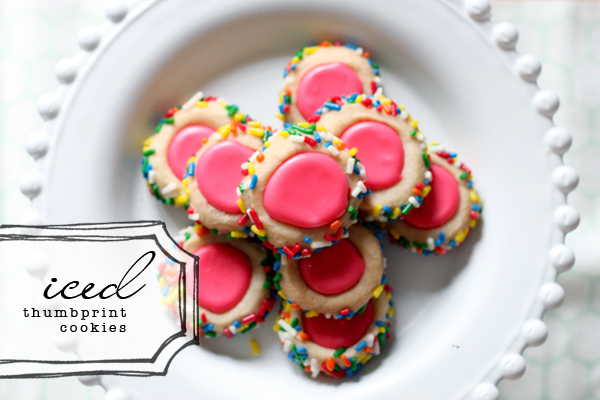 I made them again last weekend as traditional thumbprints for a party. No sprinkles though. I added the flour more carefully and did not need to add more. They came out PERFECT! and now I get to share your recipe with the friend who threw the party. They look and taste exactly as I remember from childhood. It is definitely the salty/sweet combination that makes them so yummy. Thank you SO much for coming back and commenting. I am so happy you gave it another shot and it turned out so well!! I just love this recipe and I just hope others appreciate it like you! Yay for sweet and salty!!! I made these tonight to take to my daughter's last day of dance tomorrow. I remember them as well from childhood and I still love them from a certain bakery here in town. ; ). Lesley I was sooooooo impressed with the recipe!!!!! You nailed it!!!!! They are amazing! Thank you so much, Mindie!! I'm so glad they turned out for you. We just love them around here. I'm so happy you liked them! Thanks for coming back and letting me know you made them! Oooh, what is this pintertest kitchen you speak of? I'm intrigued. I am making these today. I'm linking it up on Thursday. You should link something too. I can basically guarantee mine won't look like yours. I'm excited to hear how they turned out! Thanks for the link, I'm checking it out. just wanted to tell you that i made these last night, didn't change a thing and they are absolutely wonderful! thanks for sharing your recipe! Awesome! Thanks for letting me know! Glad you enjoyed them! Yay! So glad you liked them and thanks for letting me know. thank you.These were my favorite from a long closed bakery. Thanks for posting this recipe! Its so close to a cookie I grew up with at a local bakery but the cookies have become ridiculously overpriced. I love them! Awesome!! Thanks for coming back and letting me know! A friends daughter agreed to help make cookies for a baby shower I hosted. I gave her this recipe - and THESE ARE AWESOME!!! They were so pretty with the pink frosting and sprinkles - and so yummy! YAY!! So happy you liked them!! I made these today for my Grand daughter's graduation.. I added 1 cup finely toasted chopped pecans to the batter.. and added butter and vanilla to the icing... Scrumptious.. and pretty..
Also, I'm going to ad a bit of minced walnuts! I'll let you know how they turn out! Thanks for the recipe. We just tested these out to take to school for 5 year old little girl birthday instead of buying the famous decorated sugar cookies and they are amazing!!!! We will definitely be taking them to school to have with birthday story next week! Really delicious...was looking for a recipe like a bakery cookie I had tried...found this one, it was AMAZING! They were gone in no time, and I'm already making a second batch! Ok it says paddle attachment, I have a dough hook and flat beater. Which would work better? My mom has made these for years! Always a favorite! Never thought of rolling them in sprinkles! Fun and festive and could change up the colors for any time of year/occasion. Thanks for the idea! I've been looking for this recipe for about 2 decades. My Nana made them for Christmas and they were one of my favorites, but no one remembered them but me. Thank you so much! I made these for a cookie exchange, they were a hit!! I rolled them in silver sprinkles and kept the icing cream colored. I added a little almond extract to the icing and piped it in. They were elegant and delicious. Everyone LOVED them! Thank you for this yummy recipe! If you use salted butter that is why people have complaints that they feel they are too salty. My mom always told me that if you would use self rising flour, leave out the salt, baking powder and soda, etc then the salted butter would not make it too salty. 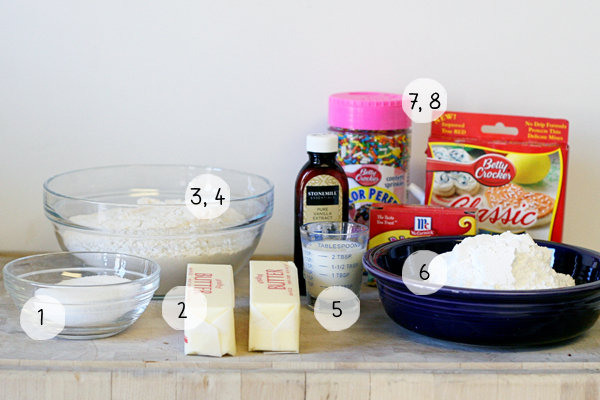 If you use the plain flour and add all theses ingredients then use unsalted butter. She learned that making her speciliaty cakes like wedding cakes, birthday cakes, etc. in her homemade layers.